Quail is a collective name for several genera of mid-sized birds in the pheasant family Phasianidae, or in the family Odontophoridae. The below address the Old World species (Europe, Africa, Asia) . The New World quails (endemic to the Americas) are not closely related, but are named for their similar appearance and behaviour. Please note that the buttonquails, found in the Old World, are not true quails. The quails are small, plump terrestrial birds. They are seed eaters, but will also take insects and similar small prey. They nest on the ground. They are capable of short, rapid bursts of flight. Some species, including the Japanese and Common Quail, are migratory and fly for long distances. Some quail are farmed in large numbers. These include Japanese Quail, also commonly known as coturnix quail, which are mostly kept to produce eggs that are sold worldwide. 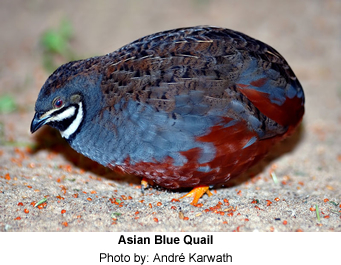 Japanese Quail, Coturnix japonica: Endemic to East Asia, abundant across most of its range. They migrate to Manchuria, southeastern Siberia, and northern Japan, and winter in southern Japan, the Korean Peninsula, and southern China. Their preferred habitats are grasslands and cultivated fields. The plumage is a speckled yellow-brown, with a creamy white strip above the eye. Adults are approximately 20 centimeters in length. Stubble Quail, Coturnix pectoralis: Resident of eastern, south-eastern and south-western Australia and Tasmania, where it is abundant. It inhabits agricultural areas, wet grasslands, coastal heaths, roadsides and neglected pastures. New Zealand Quail or Koreke (maori name), Coturnix novaezelandiae Extinct since 1875. The male and female were similar, except for the fact the female was lighter. Rain Quail, Coturnix coromandelica : They inhabit grassland, cropped fields and scrub in the Gangetic plains of central India and parts of peninsular India. They migrate further south in winter. They lack barring on the primaries (longest wing feathers). Male has a black breast-patch and distinctive head pattern of black and white. The female is difficult to separate from female Common Quail and Japanese Quail but the spots on the breast are more delicate. Call is a metallic chrink-chrink. Brown Quail aka Swamp Quail, Coturnix ypsilophora : Their preferred habitat includeagricultural areas, wet grasslands, shrublands and freshwater wetlands across much of New Guinea and the Lesser Sunda Islands as well as in northern, eastern, south-eastern and south-western Australia and Tasmania, though absent from arid regions. This species has been introduced to Fiji and New Zealand. They are widespread and common throughout its large range. Asian Blue Quail aka Chinese Painted Quail, King Quail or Blue-breasted Quail, Coturnix chinensis: This is the smallest of the true quails. They are endemic to southeastern Asia to Oceania. It is sometimes referred to as "Button Quail" - but button quails belong to the hemipode family, which is unrelated. These quails have become a favorite in aviculture, as they beautiful and hardy, and can become very trusting / tame. Additionally, numerous mutations have been developed. They are prolific breeders and reproduce at an incredible rate. A female will lay an egg a day if kept on the proper diet. They need only about a two foot long cage to breed successfully, but three times the space is needed for them to really thrive and to avoid fights. Snow Mountain Quail, Anurophasis monorthonyx : The Snow Mountain Quail is a large quail, approximately 11 inches (28 cm.) in length with a dark brown plumage, a horn-colored bill, yellow legs and brown irises. The underparts of the female are whitish and more heavily black barred than in the male. An Indonesian endemic, the Snow Mountain Quail is confined to New Guinea's highest elevations, the Snow Mountains of Irian Jaya - in the Alpine grasslands at an elevation above 9850 ft (3000 metres). The female lays up to three pale brown, dark-spotted eggs in a hollow nest under the edge of a grass tussock. The diet consists mainly of seeds, flowers, leaves and other vegetation matters. Due to its limited range and it being unprotected by Indonesian government, the Snow Mountain Quail is evaluated as Near Threatened. 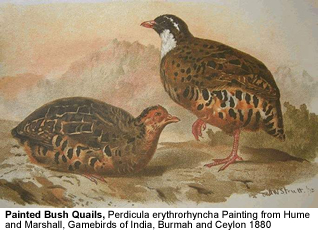 Painted Bush-quail, Perdicula erythrorhyncha: is found in the hill forests of India. They move in small coveys on hillsides and are distinguished by their red bills and legs. They have a liquid alarm call and small groups will run in single file along paths before taking flight when flushed.